Note: this blog post was originally published on our career advice column on Inside Higher Ed (here). The author is a Ph.D. candidate at a large public university. I was at a brunch hosted by graduate students of color when I decided to pursue my Ph.D. at a historically white university in the Midwest. The students shared refreshingly real stories and praised the department’s racial climate committee. This brunch, an act of service by students of color, was the highlight of my visit. But for students of color, doing service has a dark side. Service can make us hypervisible as problems and invisible as scholars. Unfortunately, it took me four years to learn that lesson. As a black woman, I believe we should “lift as we climb.” So once in graduate school, I became a service superstar. I sat on panels, sent welcome emails, organized food orders, located paper plates and sent Doodle polls. I called out faculty members when I thought it would help. I served on the racial climate committee for three years. I helped to revitalize recruitment of underrepresented graduate students, respond to microaggressions committed by white graduate students and support efforts to increase the proportion of faculty of color in our department. I did this while doing typical graduate student work like taking and teaching classes, submitting institutional review board proposals, doing fieldwork and publishing articles. My service experience had fantastic highs and concrete results. Our gatherings made us feel better, and we convinced a few prospective students of color that our campus could be a place for them, too. Faculty members said nice things in meetings that made it sound like they “got it.” It felt like my efforts were making a change. Service also helped my departmental comfort level. As a first-generation college graduate, I often felt insecure as I tried to master ways and skills of interacting that were foreign to me before college. Participating in meetings with faculty members made me feel like I belonged. But the lows of service outweighed the highs. I already felt hypervisible in my department’s hallways, which were dominated by white faces and by people who routinely confused me with other black women. Doing service made me visible in another way: as the outspoken black woman in meetings and the author of countless emails. Worse, my hypervisibility as a brown body and as a symbol of “those activist grad students” came with the twist of feeling invisible as a whole person, or even as a scholar. Around my fourth year, I realized that, for all the appreciative nods that faculty blessed me with in meetings, I still could not fill my dissertation committee. When I met with professors who seemed to be an intellectual fit, I encountered indifference. When I met with professors who did support my research, our conversations dissolved into rehashing campus climate controversies. My service was haunting me, even when I wasn’t working on it. Feeling drained, I stopped doing service. I realized that I was contributing to a disturbing pattern where students of color give of ourselves until we are running on empty. Fortunately for the department, another student of color is usually waiting to serve. The department benefits from our labor while we pay the costs. In fact, historically white departments can rely on the physical and emotional labor of students of color to mask larger racial problems. Graduate students of color are often tasked with recruiting other students of color. We are expected to support undergraduate students of color who are harmed by racially insensitive curricula. We are tasked with explaining to faculty members (ad nauseam), that yes, a student of color on campus faces challenges. Undergraduate students of color flock to us for care and emotional support. Those of us who study race are called on to help instructors with no expertise in the subject improve their teaching. This unseen labor is particularly high stakes as more universities turn to mandatory diversity coursesto ease racial tensions on campus. As graduate students, we do this service from a precarious position. Faculty members hold direct power over graduate students. They approve our teaching, stamp our dissertations and write recommendation letters. In a very real sense, they control our academic fate. Asking those in power to change their practices is a big risk. Our service may create the illusion that change is happening. Our service adds some brown faces for webpages and keeps some undergraduates happy. But ultimately, our service exempts faculty members from making substantial changes to the structure of the department. 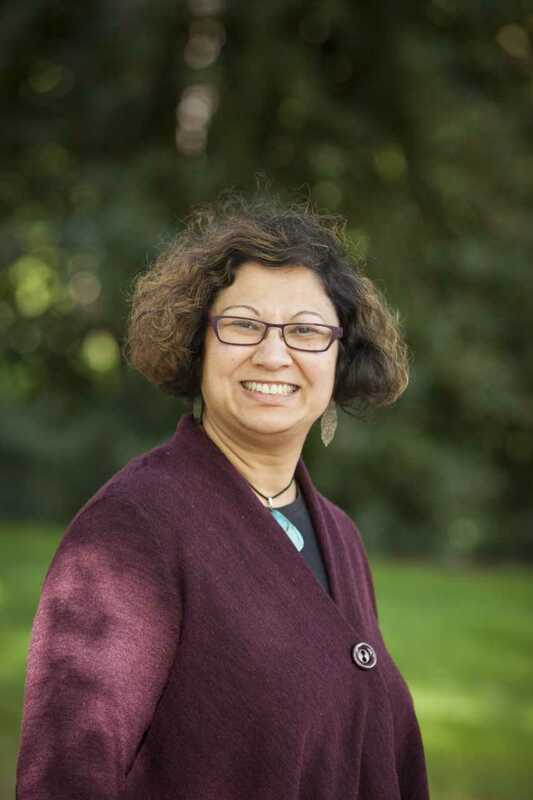 Departments need to be changed by faculty: tenured faculty members who have power and a long-term relationship with the university and, ideally, white faculty members who are allies and not already disproportionately burdened by service requests. So if you are a graduate student of color, what should you do? I would not advise you to refuse all service. Service has benefits, like making small improvements for your community, generating hope and fostering ties to colleagues and staff. But as you consider service, first refer to some of the great advice for tenure-track faculty of color. Then continuously ask yourself these questions: Are your contributions making things better for the people you care about? Are your contributions impacting faculty practices and resulting in substantial change? Do you have as many faculty members supporting your research and teaching as you do cheering on your service? In short, do the benefits of your service outweigh the costs? Such comments made it clear to me that academic spaces have firm expectations that career and motherhood are separate. I couldn’t help but also wonder how my race and gender shaped the narrative that people wrote about my choices. The social ownership of black women’s wombs is not new. Scholars like Dorothy Roberts, a professor of Africana studies, law and sociology at the University of Pennsylvania, argue that black women’s mothering has been denied and regulated for centuries — from slave owners’ economic stake in black women’s fertility to the social politics of excluding black women from any dialogue about reproductive rights. Everyone has an opinion on how to control black motherhood, leaving us conflicted and stressed in workplaces across the United States. In academe, the alleged home of intellect and forward thinking, I was wrong to expect more. As a medical sociologist, I am hyperaware of the health problems facing black mothers. Contemporary statistics on the mortality rates of black mothers and their infants are startling. Black women are two to three times more likely to die in childbirth than white women, and black mothers are more likely to have preterm deliveries than white women. Sociologists admit it is typically difficult to disentangle the effects of race and socioeconomic status on a given social problem. But when it comes to motherhood, it is clear that unequal outcomes are driven by race. For example, research suggests that increased income and education are associated with lower rates of preterm births for white women but not for black women, and that infants born to low-income white mothers have better outcomes than those born to high-income black mothers. And it’s more than just differential access to community resources, as the data also show that high-income black mothers living in white neighborhoods are actually more likely to have low-birth-weight babies than high-income white mothers in white neighborhoods and low-income black mothers in black neighborhoods. The stress of racism, then, has an impact on black mothers that affects their health and that of their unborn children. When I started graduate school, I felt prepared for the stressors many black women attending predominantly white institutions face, and I was not naïve about how challenging this experience would be. Graduate school is a time of heightened precarity, intellectual insecurity and stress. Black students may be more likely than white students to deal with complex family and personal situations during their graduate career, and they are also less likely to receive adequate mentorship. Although I certainly dealt with the challenges of being a first-generation Ph.D. student, I had mentors who set the bar high yet created space for my academic babies when I chose to start my family during graduate school. One reason I made this choice is the widespread perception among academic women that graduate school is the best time to have children. If that is true, then academe needs a lot more work. One week after having my first child by C-section, I was sitting on my living room floor doing a statistics problem set with the help of two colleagues: one studying with me, while the other held my newborn. Just two weeks after the surgery, I was back in classes — theory, methods and statistics. It was physically and emotionally painful, but unfortunately, if I wanted to be taken seriously as an aspiring academic, I felt it was my only choice. At that point, I understood two things about my academic path: racialized motherhood comes with certain expectations, and mainstream organizations were not built for mothers. The university’s maternity leave policy was not useful for a first-year graduate student. At the time, I could have taken up to six weeks — which is half the semester. I’m still not sure how someone can take half a class, so if I had used this leave, I don’t know how I would have made up six weeks of missed course work. And since first-year courses are consecutive and sequential (for example, Research Methods is a yearlong course with a fall and spring component), I might have had to defer my first year and start graduate school with a different cohort. Moreover, looming in the background of my decisions was the reality that mothers face social sanctions in the workplace because of the perception that they are less competent than women without children — even though there is no clear evidence supporting this perception. This institutionalized maternity leave policy was, in practice, impossible to use, and the knowledge that informal sanctions from peers and colleagues are harsher for mothers made me push harder. Black mothers must be superwomen to be taken seriously as scholars and professionals. The stress of racism and the pressures of academe mean that mothers are constantly forced to prove their commitment to research and ability to do the work. But that kind of active coping — working harder to compensate for the strain of discrimination — can be harmful. In his research on John Henryism, Sherman James, a professor emeritus of public policy at Duke University and an expert in racial and ethnic disparities in health care, shows that active coping in the face of psychosocial stressors leads to poor health outcomes. Yet my research agenda led me to move to the Dominican Republic, family in tow, for 10 months so I could complete dissertation fieldwork. I was (and remain) committed to academic research, but what is the price for proving we belong in a place that was not created for us? For the black mothers in academe who are working hard and wiping noses, I’d like to share a few things that I learned along the way. First, reject the superwoman label. It presumes we can do it alone without self-care. I have a supportive partner, friends and family, tough and compassionate mentors, and a university policy that subsidized some of the cost of child care during graduate school. I am impressive, but I am not superwoman, and I did not do it alone. Second, be a hustler. Because of motherhood, I cannot always participate in informal gatherings leading to professional collaborations. Because of race and gender, perhaps, I may not be invited. So I reach out to colleagues one on one and, together, we can set the personal and professional terms of engagement. Next, be attuned to your own needs (mentorship, writing groups, sleep, yoga …) and prioritize plans to get those needs met. Finally, check out Dean Ashby’s suggestions for overcoming impostor syndrome. 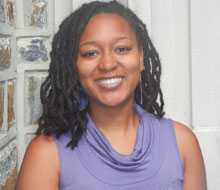 Trenita B. Childers is postdoctoral fellow at the University of North Carolina at Chapel Hill. 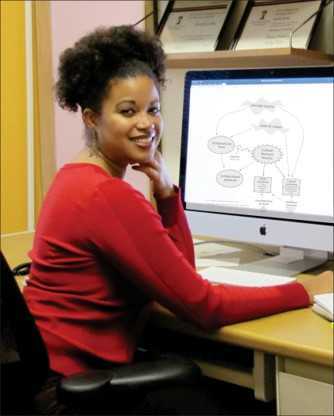 Her research examines social causes and consequences of racial health disparities. Her commentary has also appeared in the Raleigh News & Observer, and you can follow her on Twitter at @trenitac.